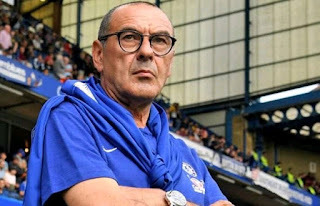 Maurizio Sarri has no interest in changing his approach after a downturn results which he got during the winter period, and he thinks that with patience, he can create a Barcelona style of play at Chelsea FC. Chelsea's 4-0 loss to Bournemouth has seen them drop out of the top four and has led to a period of new tactics for the Blues boss, who opted to drive home alone to analyse the match quickly, rather than take the team bus. “It's not my problem [if the club culture is impatient]. "I want to remain the same man. If I am a dreamer, I am a dreamer. If I have fun with my football, I want to play my football. "If I believe that the organisation in a team is everything, I cannot change my mind. I don't think [anything would change my mind], at the moment. I can change my mind in the future, I don't know. I changed in the past. But, at the moment, no. "If I can change the mentality of these players, they are really very suitable for my football. I think that my job is always at risk, and I love my job for this reason. I thrive on pressure. So I love my job for everything, but I know very well the rules.